Bengali Name: Sofeda ( সফেদা ). 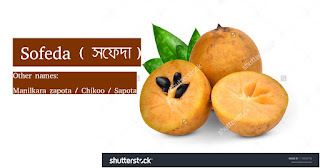 Other names: Manilkara zapota / chikoo / sapota . - It has anti-inflammatory properties. - It also has powerful anti-oxidants. - It contains potassium,copper,iron,folate,niacin, pantothenic acid. - It also contains Vitamin, A,B,C,E.